Sometimes, you can't squeeze everything in. You've done your research and you've found a lot of interesting stuff - too much, in fact, to fit in the pages of the book you're writing. So, something has to go. Highway 99: The History of California's Main Street originally included a few sections that ultimately failed to make the cut. I had to leave out an entire chapter on big rigs and truck stops that I'd intended to include, but which wound up being sacrificed when the manuscript wound up being longer than I'd intended. So here it is, the "lost" chapter, presented here for the first time with the photos I originally chose to illustrate it. Enjoy! A big rig passes an old motel sign at Desert Shores along the former U.S. 99, now State Route 86, at the western edge of the Salton Sea. © Stephen H. Provost, 2014. You can’t get too far on the highway before seeing a “Divided Highway” sign. In some places, 99 is divided by a center median, often landscaped with oleanders or other shrubs. But there’s one kind of division you’ll find on the highway no matter which stretch you’re traveling: the division between vehicles with four wheels and those with 18 (give or take a few). It’s hard to miss the big rigs, buses, tractor-trailers and the like that are so common on the highway. For years, 99 has served as the economic backbone of the state, passing through fertile farmland and industrial centers alike. Warehouses, grain silos and distribution centers line the highway. In the days of the federal highway system, it didn’t matter whether you were transporting raisins from Selma or dates from Indio: U.S. 99 was the way to go. Still, even today, if you’re behind the wheel of a Mercedes or a Mazda, you might not pay much attention to the infrastructure built around the trucking industry. The average motorist might cross the Tehachapis without taking much notice of signs with messages such as “6% grade 2½ miles ahead” and “Trucks use low gears.” Trucks are supposed to observe a lower speed limit and keep to the right, so swifter automobiles can pass. Runaway truck ramps, with their heavy gravel to slow down out-of-control big rigs, are visible on the downslope from Lebec heading north toward Grapevine. You’ll see the first one on your right, a little more than three miles north of Tejon Summit, and the second on your left less than a half-mile later. In the highway’s early days, without such precautions, accidents were far too common and, often, tragic. The original Ridge Route had more than its share of hairpin turns hugging steep cliff walls; a single mistake, even at 15 miles per hour, could be catastrophic, and the white picket fences that served as guardrails around dangerous turns were hardly sturdy enough to keep heavy truck from lurching over the edge. The 180-degree hairpin called Deadman’s Curve between Lebec and Grapevine was particularly treacherous. Once the Ridge Route Alternate was built, the straighter highway reduced the danger of missing a turn but raised a new threat: The straighter road meant trucks could build up a head of speed going downhill that made them even more dangerous if their brakes started smoking and failed unexpectedly. In 1946, The Bakersfield Californian detailed a truck’s “mad plunge” just before midnight one July evening. It went out of control and sideswiped a passenger car, sending it off the highway and leaving the driver shaken but uninjured. The truck careened on toward Grapevine, where it slammed into the rear of a van, propelling it into a row of gasoline pumps and three other cars at the Richfield filling station. The truck, meanwhile, kept going, plowing into yet another car and shoving it to the edge of the embankment, where both vehicles burst into flames. A passenger in the truck was burned to death, its driver suffered a broken leg, and the driver of the final car to be hit was hospitalized with severe burns. Other news reports told similar stories. Out-of-control trucks became, as one writer put it, “juggernauts of death” on a stretch of highway that was fast becoming known as Bloody 99: the steep grade just south of Grapevine. During one 10-day stretch in 1943, that single section of road bore witness to nine runaway truck accidents. Engineers added a concrete barrier to keep trucks from swerving into oncoming traffic, and other proposals surfaced as well. One involved requiring trucks to stop at the summit and switch into low gear before descending, though critics argued that this would merely back up traffic and create a new hazard. The café, garage and 76 station at the bottom of the Grapevine Grade bore witness to numerous crashes, as trucks came barreling down the incline and careened off the roadway. Photo courtesy Ridge Route Communities Historical Society. The Grapevine Grade wasn’t the only trouble spot. The Five Mile Grade, heading the opposite direction near Castaic, was also the scene of numerous brake failures and truck crashes. A runaway truck ramp, like those above Grapevine, was built in the 1950s to reduce the number of accidents, but it only remained in use until 1970. It was then that a freeway upgrade created a novel alignment: New southbound lanes were added, following a gentler downward slope to the east, while the old southbound route was converted to carry northbound traffic. 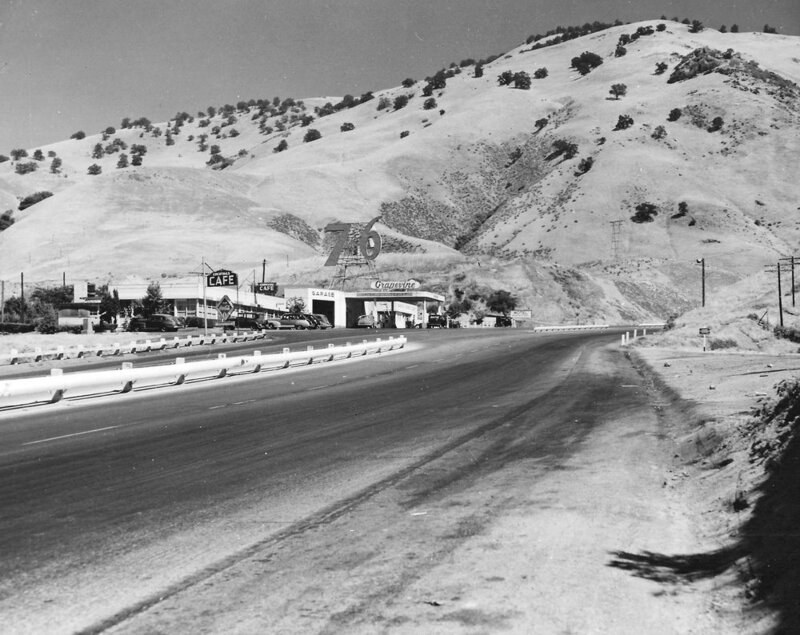 As a result, drivers traveling over the five-mile stretch between Castaic and Violin Summit progress British-style, on the left of oncoming traffic. (A significant gap separates the two segments of roadway). The emergency ramps came in handy, not only for truckers, but also for law enforcement. On at least one occasion, one of the ramps Grapevine Grade halted more than a runaway trucker: They stopped an accused runaway kidnapper. In January of 2008, Highway Patrol officers and Los Angeles responded to a report that a man had assaulted his estranged wife and abducted their child, making his escape in a stolen truck. The officers pursued the suspect northbound over more than 70 miles from Highway 101 onto Interstate 5 before the chase finally ended just north of Grapevine. It seems the man mistook one of the runaway truck ramps there for a highway exit and found his vehicle immobilized by the coarse gravel. One reason the trucks can be so dangerous on a steep downhill slope is their weight. Big rigs can weigh up to 40 tons, compared to the typical car at only 2½ tons. Once they get going at highway speeds, they can require two-thirds more pavement to stop once the brakes are applied – if the brakes are working. That’s part of the reason California requires trucks rated above a certain weight (currently 11,500 pounds) to stop at scales cleverly designated as “weigh stations.” And it’s no accident that two of the eight or so weigh stations along the historic U.S. 99 route can be found at either side of the Tehachapis, just south of Castaic and slightly north of Grapevine. A small truck scale business operates at the northbound entrance to Highway 99 off Herndon Avenue, north of Fresno. © Stephen H. Provost, 2014. Scales are far from the only highway business to have emerged in support of the trucking industry. As the nation shifted from the railroad to the highway as its primary means of transporting goods, a new industry sprang up to support the drivers who spent days away from home, driving long hours cross-country. They needed places to spend the night, to clean up, to grab some coffee and get a bite to eat. They also needed a place to buy the kind of fuel their semis ran on, diesel, which wasn’t always available at traditional gas stations. Truck stops sprang up to fill these needs. Some establishments that catered to travelers and tourists, such as Sandberg’s, refused to serve truck drivers. But other stops along the old Ridge Route and elsewhere offered various combinations of a garage, cheap accommodations and a diner or coffee shop that suited truckers pretty well. As time passed, some roadside establishments started catering specifically to truckers, seating them first at the lunch counter or offering them a place to shower in the back. When it came to sleeping arrangements, truckers had to make do. During the early years, some stayed at roadside auto camps, and many roughed it by sleeping in their vehicles, whose wooden seats were anything but the epitome of comfort. Anything more elaborate was usually improvised, and not necessarily any more comfortable. One San Joaquin Valley-based company rigged up a couple of ’22 Packards with wooden boxes over the cabs where the relief driver could sleep. The casual observer might have feared an appearance by Dracula at any moment. By the mid-1930s, however, a few manufacturers had started offering sleepers as part of the package. The wooden boxes gave way to so-called “coffin sleepers,” cramped quarters usually placed directly behind the cab. These compartments might have been 2 feet wide by 3 feet tall, giving the occupant barely enough room to turn over. Drivers with claustrophobic tendencies need not apply. In the early 1950s, Kenworth offered a CBE model, which stood for “Cab-Beside-Engine.” The CBE design included a sleeping space for the relief driver between the cab and the engine, a configuration that earned it the nickname “suicide sleeper”: Few occupants could expect to survive a crash while they slept right next to the engine. As trucks gained horsepower and gained load capacity, there was often no longer room for them at the inn. Many early motor courts included carports alongside their cabins, but they were called CARports for a reason: They didn’t provide enough clearance for trucks. Drivers ran into the same problem at some service stations, where canopies built to shield pumps from the elements were often too low to allow larger trucks access. A mural outside Clark’s Truck Stop in Indio celebrates the history of U.S. 99. © Stephen H. Provost, 2015. Truck stops offered an array of services that establishments catering to the auto traveler did not. 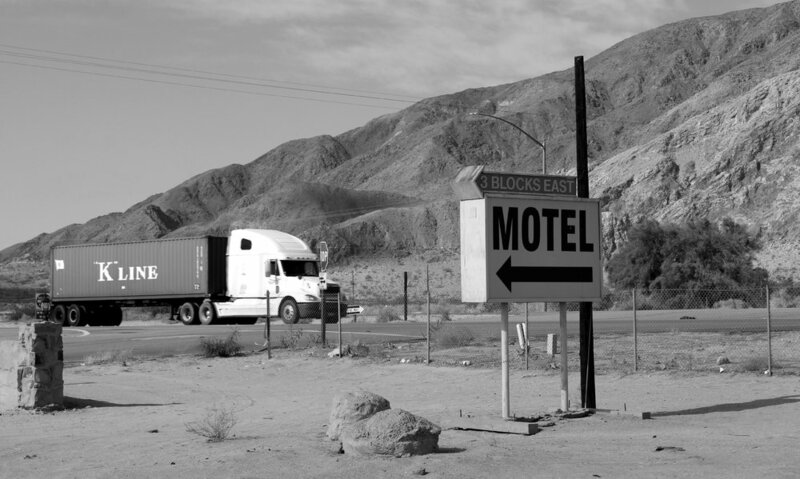 Many of the earliest among them, like the earliest motels and gas stations, were independent operations, but larger companies soon entered the fray once they realized they were missing a large segment of the market. Flying A’s flat-top station in Fresno, with its 110-foot “GAS” tower on the west side of 99, was a prime example of an early truck stop. The canopy was 70 feet high, providing ample room for trucks – which got their own separate entrance. Diesel fuel was available; there was a “completely equipped” truck lube pit, a public scale capable of weighing the largest truck on the road, and free shower rooms for all truckers. The expansive parking lot provided room for truckers to park their rigs and get a few hours’ worth of shuteye. Klein’s Truck Stop at Herndon Avenue north of Fresno had a reputation among locals as serving some of the best breakfasts in town. But truckers were the most valued clientele: They were always served first. © Stephen H. Provost, 2014. The restaurant at Klein’s Truck Stop in the hamlet of Herndon, just north of Fresno, earned a reputation for serving among the best breakfasts around. The restaurant stayed open into the new millennium before finally closing its doors, yielding to a Taco Bell and an am/pm minimart while maintaining a huge parking lot as a place for truckers. One traveler from Los Angeles endorsed it by stating that, no matter how hungry he might be, he always held his appetite in check if he were within 50 miles of Klein’s. 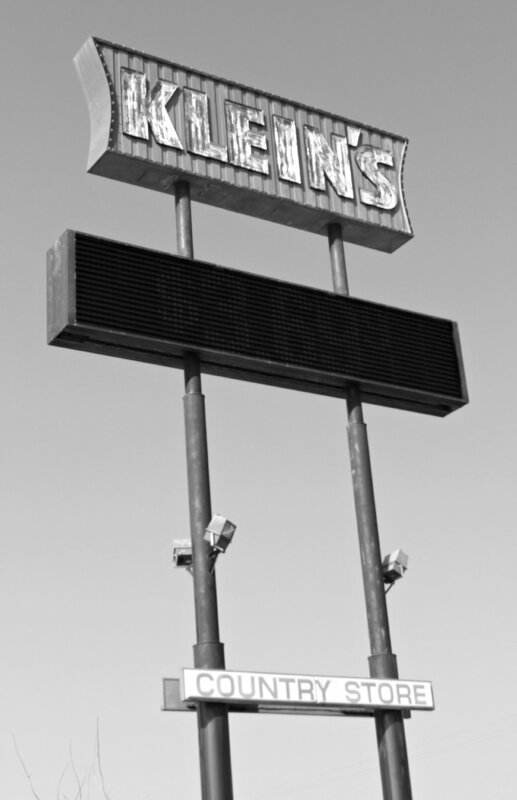 As time passed, places like Klein’s were eclipsed by truck palaces called travel plazas or travel centers, giant complexes along 99, I-5 and other major highways that were affiliated with big chains. And as the complexes grew bigger, a funny thing happened: Suddenly, they weren’t just for truckers anymore. Convenience stores served as many travelers as truckers, selling touristy T-shirts and CDs alongside motor oil and citizens band radio accessories. Flying J, with four locations along the old 99 route, offered such amenities as Subway and Denny’s restaurants, 14 showers, a CAT scale, public laundry, video game arcade and ATMs at its site north of Bakersfield. Pilot, which bought out Flying J and had six locations along the old highway route as of 2014, offered another option, as did Petro Centers (four), Love’s Travel Shops (four) and TA Travel Centers (five). 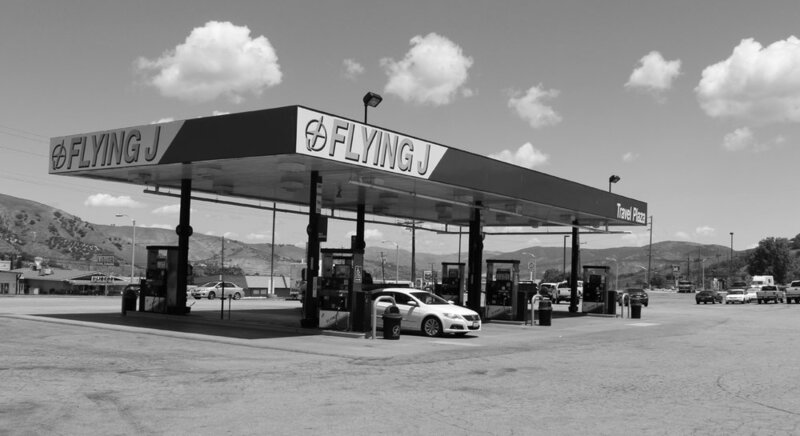 The Flying J Travel Center at the Frazier Park exit from Interstate 5 is a convenient and popular midway point to gas up and get refreshments between Bakersfield and the San Fernando Valley. © Stephen H. Provost, 2014.